Roll the pizza dough onto a floured work surface. Using a pizza cutter, slice the dough from top to bottom, into half-inch strips. Then cut the strips in half. Pour the tomato sauce into a small saucepan. Add the oregano and stir to combine. Lightly sprinkle the shredded cheese over the dough strips. 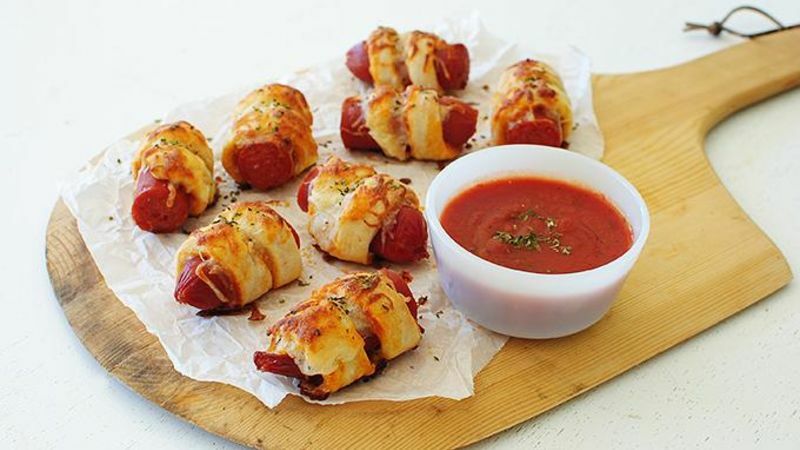 Place a pepperoni half at the tip of each strip and roll the dough around it, creating the pig in the blanket. Repeat with remaining pigs. Sprinkle each one with more cheese. Bake roughly 12 to 15 minutes, or until the dough is cooked through and the cheese is browned and bubbly. In the meantime, warm the sauce. Serve pigs with tomato dipping sauce. I never met a pig in a blanket I didn't like. But I'm not talking about like. I'm talking about love. Because these little piggies ain't just regular ole piggies. They're PEPPERONI piggies with tomato sauce and melted cheese and pizza dough. Pizza piggies. In pizza dough blankies. AAAAND this little piggy went into Bev's mouth. Amen. So okay. Just empty some Muir Glen tomato sauce into a little saucepan and add some dried oregano. Easy. Roll some trusty Pillsbury pizza dough onto a floured work surface. Slice the dough from top to bottom in little half-inch strips. Then cut them in half. This is already getting so good. The pepperoni sticks. Now, I bought the thicker ones to try and mimic the piggies, but you can buy the super thin ones if you want! They may even work better. Do it and let me know. And invite me over for a taste test. But don't even think about calling if I can't taste them. So, one thing that I want to mention is that I spread a weeee (Get it? Pig on the way home? No? Okay.) bit of the sauce over each strip, but you reaaaaaally don't have to do this part, as you'll be dipping the piggies into the sauce later. I just like to be complicated. But you should spread a little cheese over each strip! And then roll the pepperoni up into each strip. I'm about to cry weee weee weeee all the home IF I DON'T EAT MORE. Bev screams a lot, doesn't she? For more musings, visit her blog Bev Cooks and her Tablespoon profile.